Treat your body with this wonderful hamper packed with natural skin care products made on the Mornington Peninsula and delivered right to your door. 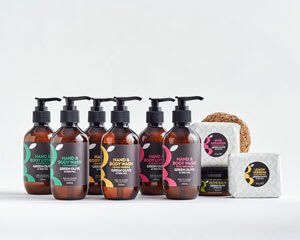 Designed to cleanse, moisturise and soothe, all these luxurious skin care products are 100% Australian made and include sustainably produced, farm grown ingredients from the Mornington Peninsula in Victoria. Order now for a fantastic gift!